Delta–beta (δβ) thalassemia is a group of heterogeneous disorders characterized by the increased levels of fetal hemoglobin (HbF) in adult life. Several types of δβ thalassemia exist on the basis of molecular defects. Here, we present a family with Asian Indian inversion deletion Gγ (Aγδβ) 0 with variable phenotypic expression. A 29-year-old male presented with pallor, complaints of fever off and on, and history of jaundice 3 months ago. On examination, there was mild pallor and no icterus, and on per abdomen examination, hepatosplenomegaly was present. Ultrasound abdomen showed cholelithiasis and splenomegaly. Complete blood count showed microcytic hypochromic anemia (Hb = 12.3 g/dl, mean corpuscular volume = 65.1 fl, mean corpuscular Hb = 21 pg, and mean corpuscular Hb concentration = 32.3 g/dl), with raised red cell distribution width (57.4 fl). Reticulocyte count was increased (corrected reticulocyte count: 4.3%). 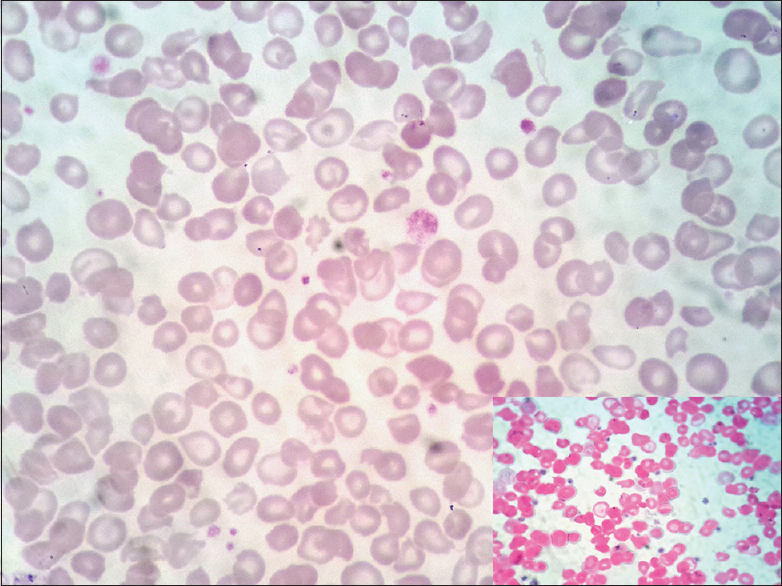 Peripheral smear revealed microcytic hypochromic red blood cells with moderate anisopoikilocytosis and the presence of few target cells and teardrop cells and many polychromatophils [Figure 1]. Few red blood cells showed Howell–Jolly bodies. Liver function tests revealed indirect hyperbilirubinemia (total serum bilirubin = 3.7 mg/dl and indirect bilirubin = 3.1 mg/dl). Serum iron was 30 μmol/L and serum ferritin was 167.2 μg/L. Serum folate was normal (4.99 μg/l) and serum vitamin B12 was reduced (60 ng/L) for which the patient received Vitcofol injections. A clinical diagnosis of hemolytic anemia was made. 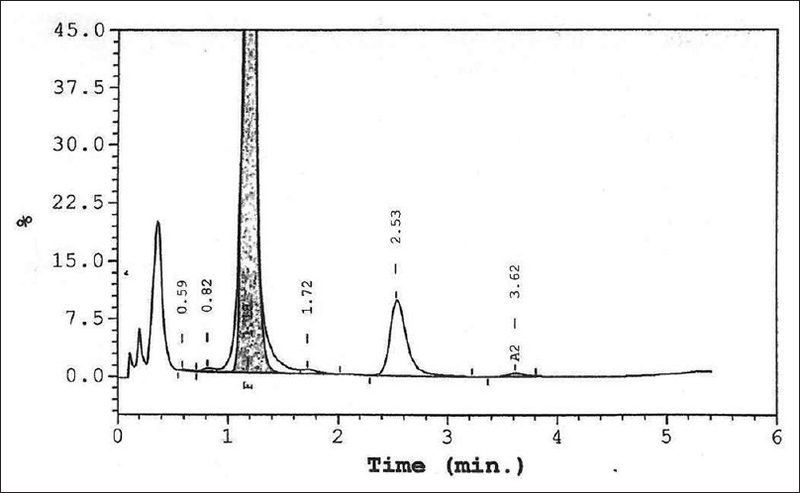 Hb high-performance liquid chromatography (HPLC) showed markedly raised HbF (94.5%) and low HbA2 (0.5%) [Figure 2]. Kleihauer's test showed the presence of many F-cells and few ghost cells [Figure 1] inset]. Possibility of δβ thalassemia was suggested. Family study was performed. Both the parents and brother were clinically asymptomatic, and their complete blood counts were unremarkable except for mild anemia in the father and brother. Hb HPLC revealed raised HbF in father (18.9%) and brother (19.7%). Kleihauer's test revealed ghost cells and fewer F-cells in both the father and brother. Thus, their probable diagnosis was heterozygous δβ thalassemia. The mother showed normal HbF with borderline HbA2 (3.2%) on Hb HPLC. DNA analysis for HPFH-3, Asian inversion deletion Gγ (Aγδβ) 0, β-thalassemia mutations by amplification refractory mutation system polymerase chain reaction, α gene deletions and triplications and DNA sequencing for β-globin gene was performed. The index case was found to be heterozygous for Asian Indian inversion deletion Gγ (Aγδβ)0 and normal for β-globin gene sequencing for exons 1 and 2. The father and brother showed the same mutation as the index case. The mother showed heterozygosity for Cap +1 (A-C), a silent β thalassemia mutation. However, this mutation was absent in index case. δβ thalassemia is a genetically heterogeneous group of disorders which are classified into (δβ)° thalassemia and (δβ)+ thalassemia. (δβ)° thalassemia is further divided into (δβ)° thalassemia in which both δ and β globin genes are deleted and (Aγδβ) 0 thalassemia in which the Aγ, δ, and β genes are deleted. Because of the presence of many deletion forms of δβ thalassemia, they are further classified according to the country in which they were first identified. The clinical phenotype and HbF levels in patients of δβ thalassemia are variable. This case is unusual, in that the same mutation (Asian Indian inversion deletion Gγ [Aγδβ]0) which caused overt clinical hemolysis in the index case did not lead to any symptoms in the father or brother. The mother carried Cap +1 (A-C), which is a silent mutation. It has minimal effect on β globin synthesis because of which basic hematological parameters and Hb A2 levels remain in normal range and patients are clinically asymptomatic. This mutation, therefore, can only be identified at the molecular level. 1 Importance of Cap +1 mutation is that if it exists in a compound heterozygous state with β thalassemia minor, it may present as thalassemia major or intermedia. This mutation was however absent in the index case, indicating that the phenotypic variation of δβ thalassemia in the index case was due to some other causes. The variation in clinical severity may be due to the effect of genetic modifiers., The probable causes could be genetic variation of chromosome 6 which affects the HbF levels, or single-nucleotide polymorphism of the β globin gene or a new mutation in the index case which was not picked up by the molecular techniques applied. An extended molecular analysis is needed in such patients to define the genotype for different genetic modifiers and to understand their phenotypic modulation abilities. Thus, this case is being reported because it is an example of unexplained phenotypic heterogeneity of δβ thalassemia. Karim MU, Moinuddin M, Babar SU. Cap +1 mutation; an unsuspected cause of beta thalassaemia transmission in Pakistan. Turk J Haematol 2009;26:167-70. Galanello R, Origa R. Beta-thalassemia. Orphanet J Rare Dis 2010;5:11. Fucharoen S, Pengjam Y, Surapot S, Fucharoen G, Sanchaisuriya K. Molecular and hematological characterization of HPFH-6/Indian deletion-inversion ggamma(Agammadeltabeta) 0-thalassemia and ggamma(Agammadeltabeta) 0-thalassemia/HbE in Thai patients. Am J Hematol 2002;71:109-13.